Prices are stated/ in US Dollars. Prices subject to change without notice. 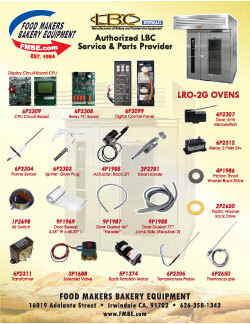 Food Makers Bakery Equipment reserves the right to correct pricing errors at any time. 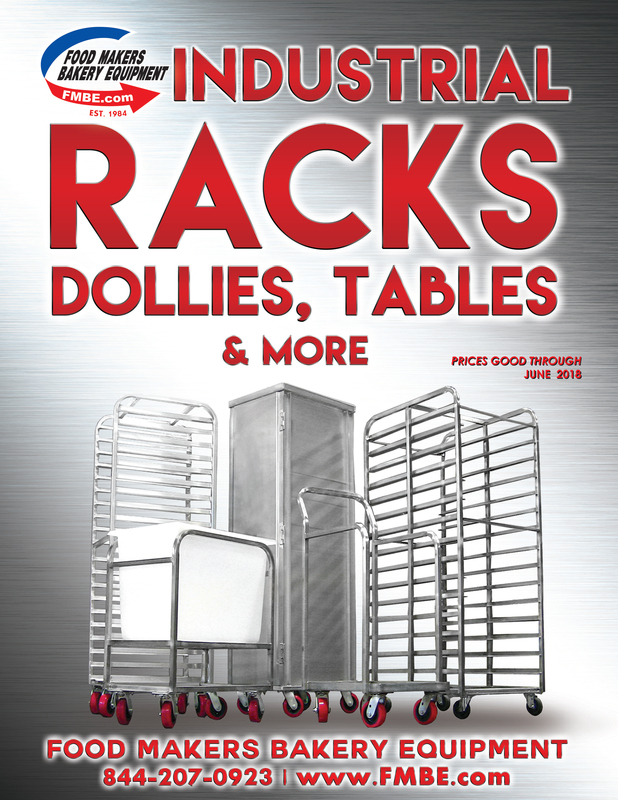 Pricng on shipping may not be charged depending on certain classes of items such as racks that are in class 250. Shipping option will be "Shipping Charged Separately". Shipping or Delivery dates are approximate. 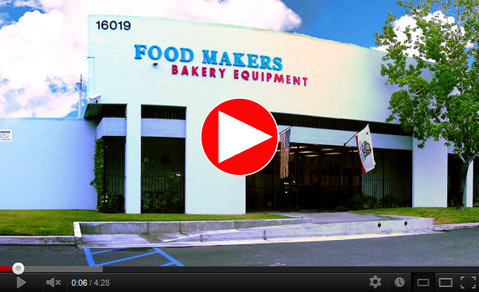 Food Makers Bakery Equipment will not be held liable for any causes beyond it's control. Food Makers Bakery Equipment will not be liable for loss of revenue due to delayed delivery or installation of equipment. Racks and other custom made items have 1-4weeks estimated production time. We will notify you on when items can be completed and shipped out to you. Many over sized items and in class 250 will not be charged at the time you place the order and your options are Shipping Charged Sepearately, Local Pick up. You can also . 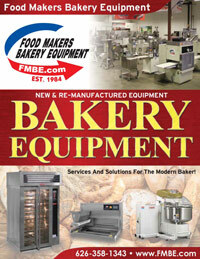 Food Makers Bakery Equipment reserves the right to ship via any responsible carrier. Once full payment for merchandise and freight is received, items will be made ready for shipment. Items are shipped Common Carrier or UPS. 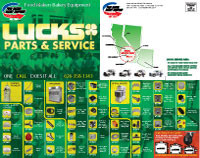 Once your item is placed on the truck for shipment, it is no longer the responsibility of Food Makers Bakery Equipment. Larger equipment delivered via a Common Carrier truck and it will be the responsibility of the customer to provide method of unloading. Food Makers Bakery Equipment assumes no responsibility for damages while in transit. Please inspect for damage and make notation on the Bill of Lading BEFORE the driver leaves your location. 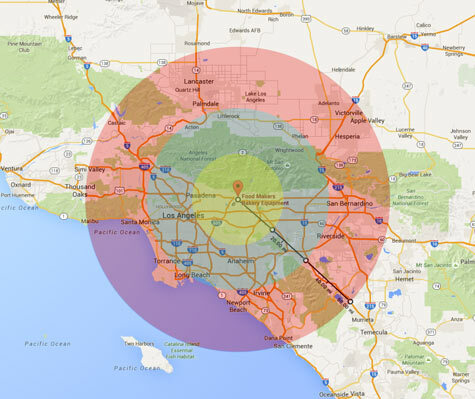 Claims for damage in transit must be made by the consignee with the Carrier. California Sales Tax plus any other applicable county or city tax will be added to all purchases that will ship to a California state address, or that will be billed to a California State address. All USED/Pre Owned Equipment is sold with a 90 day parts & labor warranty unless stated otherwise. Failure to comply with this policy will disqualify any replacement or refund. Client agrees to inspect all merchandise upon receipt. Any damages, discrepancies, defects or shortages must be reported to Food Makers Bakery Equipment within 24 hours of receipt. Parts can be returned only after obtaining a Return Authorization Number (RA#) by calling (844) 801-2676 prior to the return. Returns must include all original pieces, including hardware and a copy of your original invoice. Client is responsible for freight costs on any return. Client is responsible for re-packaging item securely to insure safe return. Clearly reference your RA# on the package. All accepted returns are subject to a 35% re-stocking fee. Shipping and handling fees are non-refundable, unless specified during Return Authorization call. Merchandise that has been installed, modified or damaged due to improper installation will not be accepted for return. Please contact Service & Parts Department for more information on returning an item. The entire content included in this site, including but not limited to text, graphics or code is copyrighted as a collective work under the United States and other copyright laws, and is the property of www.bakeryequipment.net. The collective work includes works that are licensed to www.bakeryequipment.net. Copyright 2003, www.bakeryequipment.net ALL RIGHTS RESERVED. Permission is granted to electronically copy and print hard copy portions of this site for the sole purpose of placing an order with www.bakeryequipment.net or purchasing www.bakeryequipment.net products. You may display and, subject to any expressly stated restrictions or limitations relating to specific material, download or print portions of the material from the different areas of the site solely for your own non-commercial use, or to place an order with www.bakeryequipment.net or to purchase www.bakeryequipment.net products. Any other use, including but not limited to the reproduction, distribution, display or transmission of the content of this site is strictly prohibited, unless authorized by www.bakeryequipment.net. You further agree not to change or delete any proprietary notices from materials downloaded from the site. 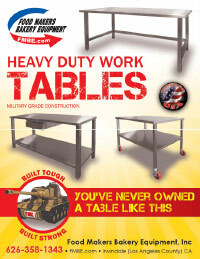 www.bakeryequipment.net shall not be liable for any special or consequential damages that result from the use of, or the inability to use, the materials on this site or the performance of the products, even if www.bakeryequipment.net has been advised of the possibility of such damages. Applicable law may not allow the limitation of exclusion of liability or incidental or consequential damages, so the above limitation or exclusion may not apply to you. In the event that a www.bakeryequipment.net product is mistakenly listed at an incorrect price, www.bakeryequipment.net reserves the right to refuse or cancel any orders placed for product listed at the incorrect price. www.bakeryequipment.net reserves the right to refuse or cancel any such orders whether or not the order has been confirmed and your credit card charged. If your credit card has already been charged for the purchase and your order is cancelled, www.bakeryequipment.net shall issue a credit to your credit card account in the amount of the incorrect price. These terms and conditions are applicable to you upon your accessing the site and/or completing the registration or shopping process. These terms and conditions, or any part of them, may be terminated by www.bakeryequipment.net without notice at any time, for any reason. The provisions relating to Copyrights, Trademark, Disclaimer, Limitation of Liability, Indemnification and Miscellaneous, shall survive any termination. www.bakeryequipment.net may deliver notice to you by means of e-mail, a general notice on the site, or by other reliable method to the address you have provided to www.bakeryequipment.net. Your use of this site shall be governed in all respects by the laws of the state of California, U.S.A., without regard to choice of law provisions, and not by the 1980 U.N. Convention on contracts for the international sale of goods. You agree that jurisdiction over and venue in any legal proceeding directly or indirectly arising out of or relating to this site (including but not limited to the purchase of www.bakeryequipment.net products) shall be in the state or federal courts located in Los Angeles County, California. Any cause of action or claim you may have with respect to the site (including but not limited to the purchase of www.bakeryequipment.net products) must be commenced within one (1) year after the claim or cause of action arises. www.bakeryequipment.net's failure to insist upon or enforce strict performance of any provision of these terms and conditions shall not be construed as a waiver of any provision or right. Neither the course of conduct between the parties nor trade practice shall act to modify any of these terms and conditions. www.bakeryequipment.net may assign its rights and duties under this Agreement to any party at any time without notice to you. Harassment in any manner or form on the site, including via e-mail, chat, or by use of obscene or abusive language, is strictly forbidden. Impersonation of others, including a www.bakeryequipment.net or other licensed employee, host, or representative, as well as other members or visitors on the site is prohibited. You may not upload to, distribute, or otherwise publish through the site any content which is libelous, defamatory, obscene, threatening, invasive of privacy or publicity rights, abusive, illegal, or otherwise objectionable which may constitute or encourage a criminal offense, violate the rights of any party or which may otherwise give rise to liability or violate any law. You may not upload commercial content on the site or use the site to solicit others to join or become members of any other commercial online service or other organization. 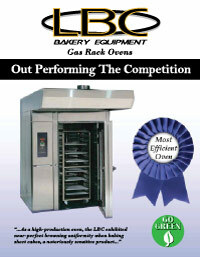 www.bakeryequipment.net does not and cannot review all communications and materials posted to or created by users accessing the site, and is not in any manner responsible for the content of these communications and materials. You acknowledge that by providing you with the ability to view and distribute user-generated content on the site, www.bakeryequipment.net is merely acting as a passive conduit for such distribution and is not undertaking any obligation or liability relating to any contents or activities on the site. However, www.bakeryequipment.net reserves the right to block or remove communications or materials that it determines to be (a) abusive, defamatory, or obscene, (b) fraudulent, deceptive, or misleading, (c) in violation of a copyright, trademark or; other intellectual property right of another or (d) offensive or otherwise unacceptable to www.bakeryequipment.net in its sole discretion. You agree to indemnify, defend, and hold harmless www.bakeryequipment.net, its officers, directors, employees, agents, licensors and suppliers (collectively the "Service Providers") from and against all losses, expenses, damages and costs, including reasonable attorneys' fees, resulting from any violation of these terms and conditions or any activity related to your account (including negligent or wrongful conduct) by you or any other person accessing the site using your Internet account. 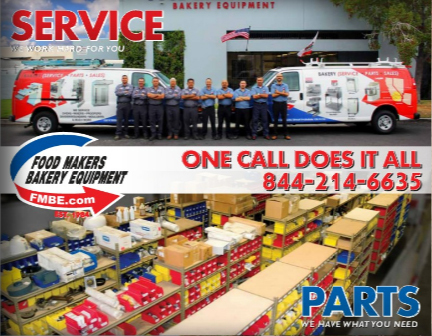 In an attempt to provide increased value to our visitors, www.bakeryequipment.net may link to sites operated by third parties. However, even if the third party is affiliated with www.bakeryequipment.net, www.bakeryequipment.net has no control over these linked sites, all of which have separate privacy and data collection practices, independent of www.bakeryequipment.net. These linked sites are only for your convenience and therefore you access them at your own risk. Nonetheless, www.bakeryequipment.net seeks to protect the integrity of its web site and the links placed upon it and therefore requests any feedback on not only its own site, but for sites it links to as well (including if a specific link does not work).